Sometimes our journey changes … we move from seeking outwards to seeking inwards. For me this began (a few years back) after I had completed a spiritual weekend. I had reached a point where it felt as if my Soul was crying out to be free. It’s not that I was not free, but rather that I was following others, letting them tell me what was true and what was not true, telling me where I had been in my sleep time, and where I was going … This had created a situation in which all of my knowing of myself came from outside myself, given to me, the picture painted by others. And so, yes, my Soul was all but crying to be free, to walk my own path, a deeply spiritual inward journey. And so, I walked away from others, and I began an inward journey. I had spent so much time being taken ‘out there’ on journeys, but I had never been told to go inward. When I did begin the inward journey … ahhh … that was when my journey Home to myself began. The starting point for my journey, at that time, was my heartspace, and it guided me through my journey inward, inward inward. The heart is the frequency key for many things, many understandings. Having always placed my faith in others, it was a new journey, and not an easy one, to learn to trust in myself, to learn to hear and feel and see and know and trust that. I had so much self doubt to overcome—and yes, there is still self doubt on many a day! It was, however, the most important journey I could ever have undertaken. Did it grant me all the answers I sought? Did it bring me happiness and bliss? Yes and no … because it allowed me the gift of healing many areas of myself. As I was ready, each issue would rise for me to have a look at it, and if I did not resolve it, it would simply continue to rise until I did. My foundations shattered away, and I felt so utterly lost on many an occasion, but this was the opportunity to create new foundations built from where I was ‘at’ at that time. And I will point out that my foundations continue to change, as I continue to change. I have got used to changing foundations, to the deconstruction process, and I have got better at allowing new foundations to form. Am I stronger? Sometimes I am too strong, and I realised just the other day that I take great pride in my strength…which is wrong. I am not balanced in my masculine and feminine sides, and I know that to be vulnerable is a balance to the strength. You see, I still have much to learn, and heal, and understand. The journey is never completed … at least not until I have truly reached my goal which is: to knowing and experiencially BE (and I borrow these words from Anita Moorjani) the physical expression of the Universal Consciousness. That is the truth I am working towards, and I only read her book a month ago, but those words were the words that I had been searching for or perhaps waiting for. As I write this I realise another thing … writing allows me to be more Soul present and less ‘I’m a pathetic human’ present (yes, I have felt a little pathetic lately, but hey, I’m human, and can be as frail as any of us!) Writing for me is almost an act of breathing. I realise now that I have to write, that if I don’t then I feel this growing restlessness inside me … and only now do I realise why I have felt so restless lately! In our life we will be guided to meet people who we are meant to meet. I met a woman and she changed my life. And so, T, I give the most heart felt and soul deep thanks. I am on another inward journey now, this one of a different nature … and I can feel myself pulling inward as if I am pulling inward to a point of light (and this understanding is only coming as I am sitting here writing—you see what I mean about writing being so important for me … it is almost as if writing allows my Soul to breathe.) What will happen when I have pulled inward to that point of light? I hope that I will then be able to be merely a physical expression of the Universal Consciousness … not the idea, not the concept, but be it!! 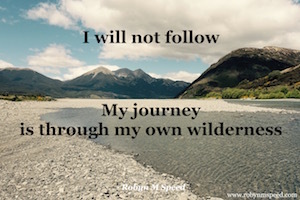 This journey is a deeply personal one, a deeply private one, and though times of joy and serenity may travel with me, so does pain and many tears, but that is all a part of the journey. I don’t know what I buried under the rock five lifetimes ago until I turn that rock over. I don’t know what I hid in the cupboard when I was 5 years of until I open that cupboard. I don’t know what I put on the shelf and ignored, until I am standing before it and knowing I need to have a look. I don’t know why I have some fears, until I look at them, trace them back to the point of origin and can then understand what it is that I am afraid of. It is not an easy journey … but it is the only one I want to walk.